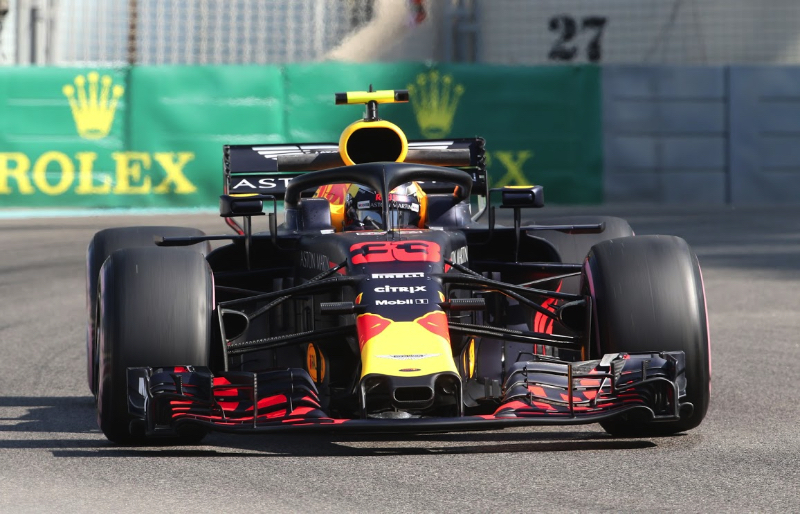 The Red Bull team was looking good in Free Practice 1 for the Abu Dhabi Grand Prix as Max Verstappen and Daniel Ricciardo were comfortably faster than the opposition. The line-up for the weekend was: Mercedes – Lewis Hamilton and Valtteri Bottas; Ferrari – Sebastian Vettel and Kimi Raikkonen; Red Bull TAG Heuer – Ricciardo and Verstappen; Racing Point Force India Mercedes – Sergio Perez and Esteban Ocon; Williams Mercedes –Lance Stroll and Sergey Sirotkin; Renault – Nico Hulkenberg and Carlos Sainz; Toro Rosso Honda – Brendon Hartley and Pierre Gasly; Haas Ferrari – Romain Grosjean and Kevin Magnussen; McLaren Renault – Fernando Alonso and Stoffel Vandoorne; Sauber Ferrari – Marcus Ericsson and Charles Leclerc. Alonso was beginning his final race weekend as a F1 driver. McLaren had painted his car in a one-off livery that incorporated his helmet colors. And he had a retrospect helmet livery as well. "Abu Dhabi will certainly be very emotional race for me, as it will be the end of a long and happy 17 years in Formula 1," he said. "The time has come for me to move on, but I'm looking forward to ending the season – and my F1 career – on a positive note. "I'm fully focused on this weekend in Abu Dhabi, and making the most of every day – in the car, with the team, and with my friends and family. Abu Dhabi is a tough circuit, but we don't have anything to lose, so both Stoffel and I will be fighting hard as always." The reserve drivers participating in FP1 were Robert Kubica in Sirotkin's Williams and Antonio Giovinazzi in Leclerc's Sauber. Raikkonen was the first out on track. The ambient temperature at the start of the 90-minute session was 82 degrees Fahrenheit (28 degrees Centigrade) and the track temperature was 109 degrees Fahrenheit (43 degrees Centigrade). Pirelli's slick tire compounds for the weekend were the super soft, ultra soft and hyper soft. The yet to be officially crowned 2018 world champion Hamilton was carrying the #1 instead of his usual #44 on the nose of his car for this session, and he was wearing a different helmet livery with gold paint. But #44 was still on the sides of the car. Nobody clocked a flying lap in the first 22 minutes of the session until Bottas set a 1:55.540. beat that that with his 1:42.586. Vettel followed up with a 1:41.135. Then Hamilton turned a 1:39.576. Just past the half hour mark Verstappen moved into the lead with a time of 1:39.287. He, like most of the drivers, was on the hyper soft Pirelli slicks. Then Ericsson spun coming out of Turn 1 and tagged the barriers with the Sauber's front wing. The official lap record is a 1:40.279 by Vettel in 2009. At the 40-minute break, when each driver must hand back one set of tires to Pirelli, the order was: Verstappen, Hamilton, Ricciardo, Bottas, Raikkonen, Vettel, Ocon, Perez, Sainz and Giovinazzi. Bottas, now on the super softs, was the first out when things got going again. But it was Verstappen who was really going as he got down to a 1:38.491. Hamilton, third behind Bottas and Verstappen, and now a second slower than Verstappen, reported: "It's quite an unhappy car at the moment." Bottas was 0.961 of a second slower than Verstappen. With 20 minutes remaining, Ricciardo moved into second, 0.454 a second off Verstappen's time. The Red Bulls stayed comfortably fastest as the final FP1 session of the season wound down. Bottas, Hamilton, Ocon, Magnussen, Raikkonen, Vettel, Sainz and Grosjean.